Several years ago, I converted what was a small garage into a large bike workshop. I had no use for the garage. It was too small for my “truck” and only collected things. Things I was simply too lazy to discard. This was no small project. First, I had to plumb and reinforce the west wall. Then, I had to rewire for the electrical for lights, extra plugs and an outdoor motion sensor light. It needed more natural light, so I added a large sliding window in the east wall. And, I needed the space to be more secure. I installed an overhead metal door at the back and replaced the wooden entrance door with a wider, and taller, metal one so the bikes could be rolled in and out more easily. It had to be insulated so I could work outside all year round, and to prevent the tools and bikes from rusting. I created storage space in the newly formed attic (I couldn’t discard everything), and then put up wood panelling in the new room. I’m proud of this space. It’s my space. It has a small beer refrigerator, an old stereo, and room to hang 6 bikes, a 30-year old hand-make work bench, and my canoe (a 50 year old relic). I tell you this not to make you jealous (I know a lot of you do not have a proper place to store and work on your bikes). No, I tell you this because I have out grown the space. Well, we have outgrown the space. You see, it’s not exactly my space any longer. I share it with my son, and a few of his bikes. I don’t mind that. In fact, I enjoy it. We share a lot of quality time in the shop working on our bikes. No. That’s not the problem. You see, my son has taken up wood working. He has always been gifted in this regard, and has hand crafted many beautiful pieces. Now he wants to take on even larger projects. And, he needs space. He doesn’t have any where he lives. Do you see the dilemma? Sawdust and bikes don’t mix. I need 2 shops. One to work wood, and another to store, maintain, and build bikes that is free of sawdust. I have space in the yard. Right next to the garage there used to be a car port. 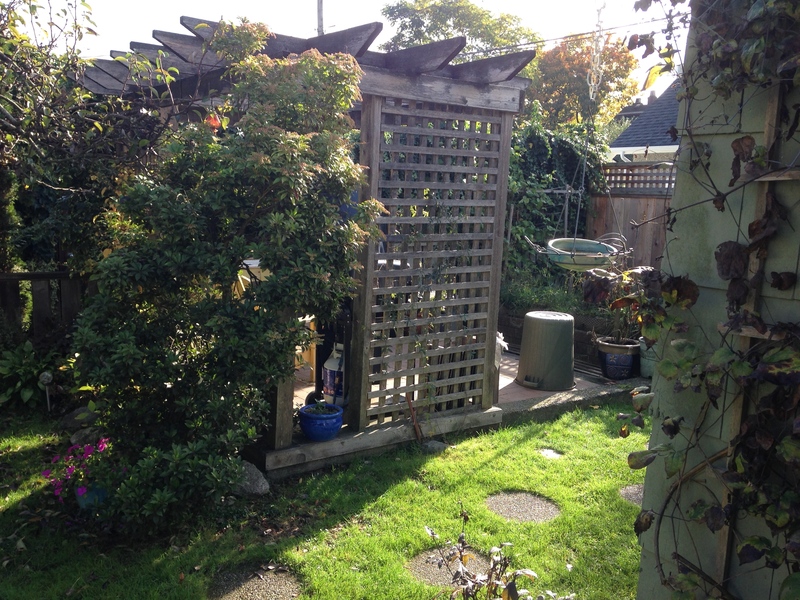 I ripped it down years ago and reclaimed the space for a small, raised vegetable garden and sitting area. Fortunately, I left the cement pad and footing intact. This 12′ x 20′ area is the perfect size for a bike studio, don’t you think? I’m at the conceptual stage. I have some ideas but I’m looking for more. I know some of you have architectural design experience. And, some of you have bike workshops. I’d like your advice. What is the best way to lay the space out? How large does it need to be? How can it be integrated into the yard? Here are several backyard studio designs that have caught my eye. Tell me what you think. What features do I need? How large does it need to be? Should it face north into the yard, or west facing the garage? With this fourth post, I nominate anyone interested in relating their studio space story, and it doesn’t have to be for bikes. I want to hear from you. What works. What doesn’t. What feature do you like the best. The worst. This entry was posted in Cycling, Photography and tagged Chas, Lou, Retirement, Studio, Thatch by PedalWORKS. Bookmark the permalink. The good thing is that you’ve had the experience of one workspace. You can now correct any oversights with the last one. It will be interesting to see what you come up with. This is true. I do have some ideas. And, the “studio” has to compliment the rest of the yard. But, I am also looking for input from others. I may not do this again, and I want to make certain I consider everything I can. That sounds reasonable. 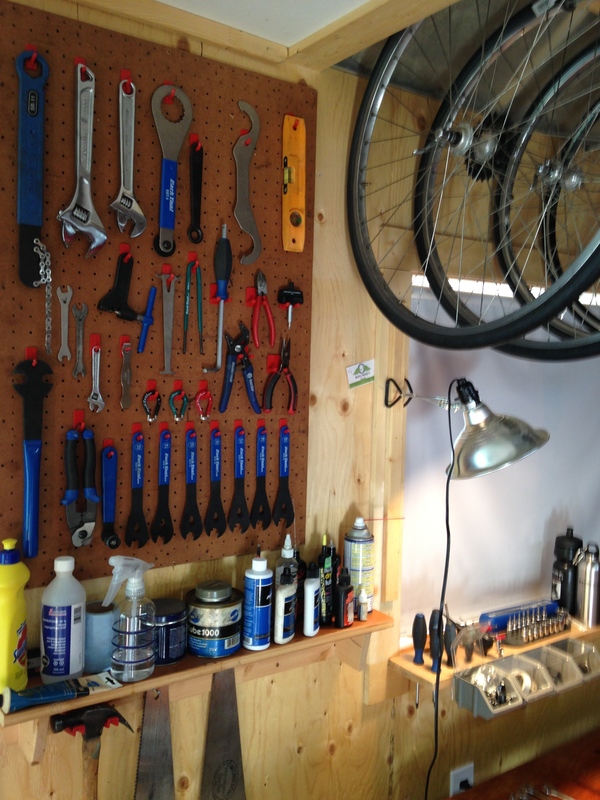 I don’t have a workspace for my bike–and don’t have the knowledge (or the tools ) to do a lot of work on it…..yet. I’d love to help….but again, without the knowledge or experience, I cannot really give any input. Fortunately, I am sure you will get a lot of input from people who follow your blog. The style wouldn’t worry me to much. I’d get the largest space allows.with good light and the best insulated available. Being my 1st post on here I’ll fill in a bit of profile. I had been a keen cyclist for 25 yrs,but due to knackered hip joints had to take a 3yr break. I’ve since had both hips replaced in the last 18 months and after 12 wks recovery started easy spinning on a stationary bike in the garage..my 1st real ride outdoors was tough nothing like a stationary bike..my balance and fitness weren’t what they used to be,but soon returned after a few rides. I’ve slowly built up to 25ml rides twice weekly,and slowly building up my wasted leg muscles after 3yrs of not being used. I really love my biking and walking again now,and make the most of every day. Carpe Diem as the saying goes. Thanks Paul in the UK. Thanks for the suggestions Paul. It’s great that you are back on the bike. Keep it up. I’m sure it will get easier and more enjoyable for you. Get an extractor for the sawdust instead? I was thinking a bit more about your future build and a thought came to me. Take some time to consider what kind of floor you want to put in. Softer surfaces are probably better for joints. Then again you might need to consider drops of lubricant and stuff like that. I don’t have any solutions, but I just thought I would put those “two cents” in. I am considering a wood floor and use a rubberized, soft mat for standing on. The mat can catch the dirt, grease, and oil. It can also ease the strain on all of the joints.